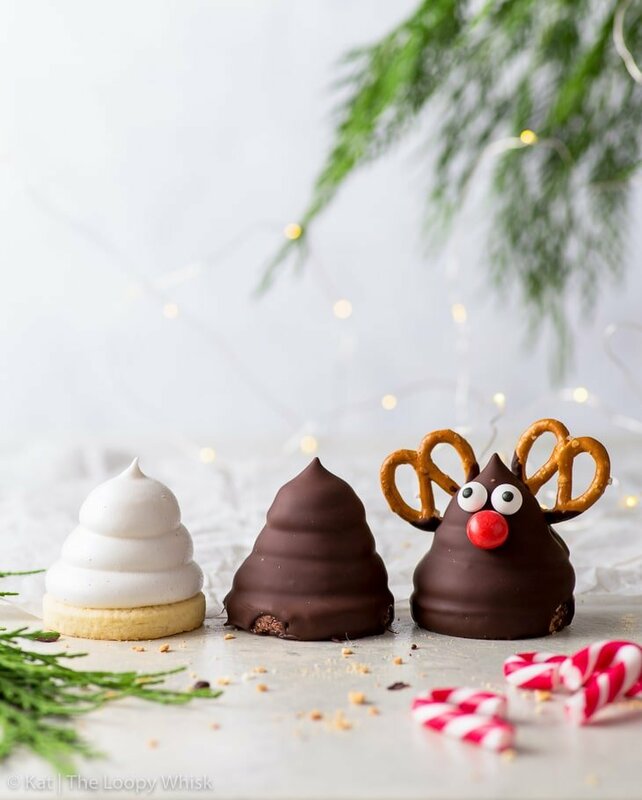 These Rudolph marshmallow cookies are one of the cutest Christmas desserts ever – and they’re simple to make! 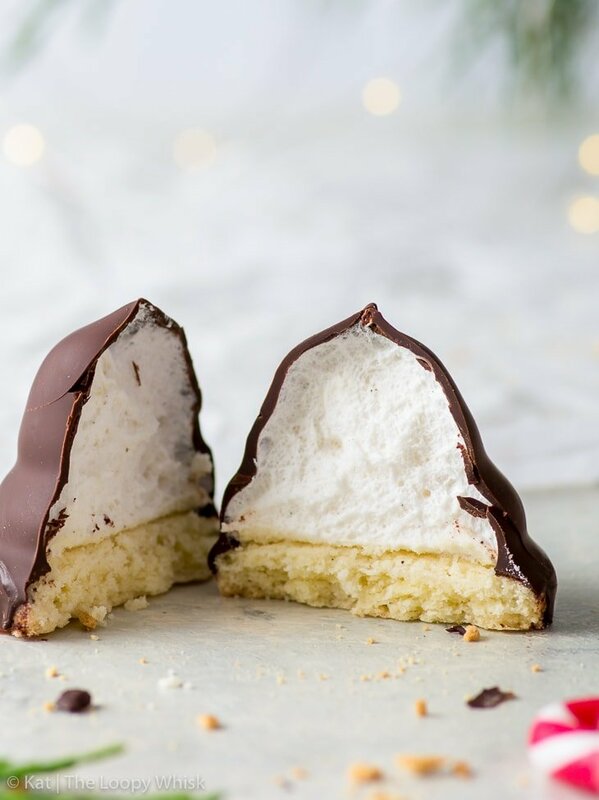 Plus, with the homemade marshmallow piped onto delicate vanilla sugar cookies that’s then dipped into chocolate – they’re nothing short of delicious. 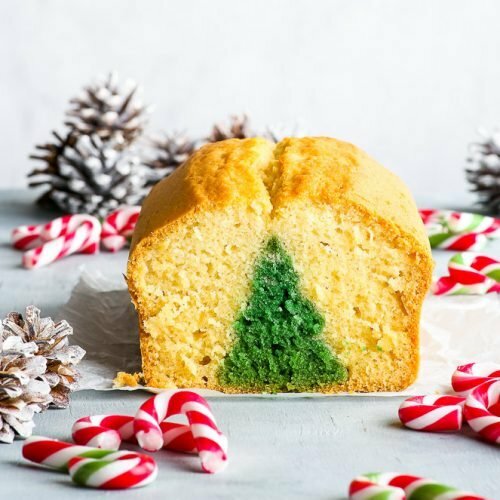 There’s no such thing as too cute when it comes to Christmas baking. It’s just a fact. 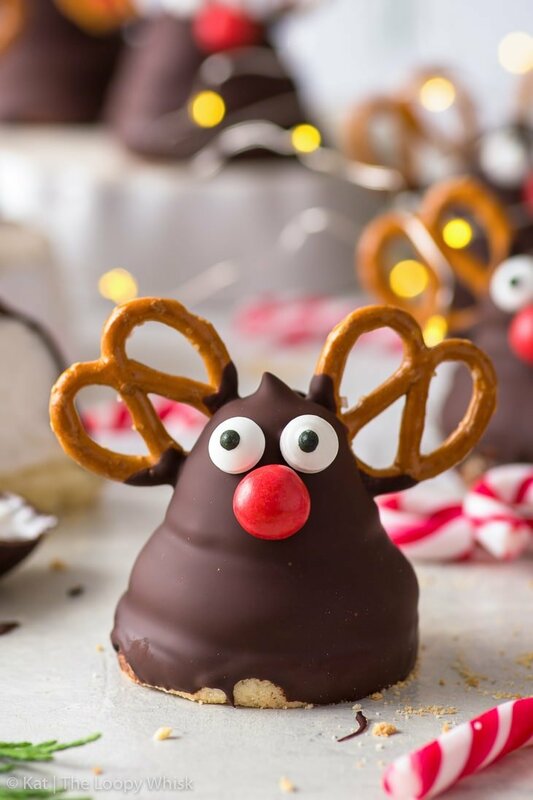 Accept it, and let out your inner kid when you make these Rudolph marshmallow cookies. 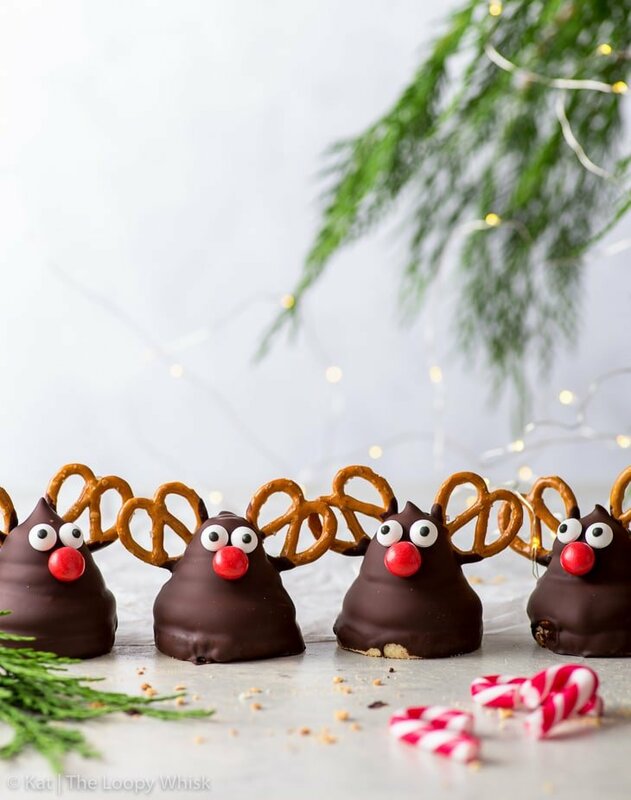 Listen, I’m all for serious baking throughout the year (I say “serious”, but I actually mean drenched in chocolate and salted caramel – just without the goggly candy eyes and cute M&M noses), but at Christmas, all bets are off. 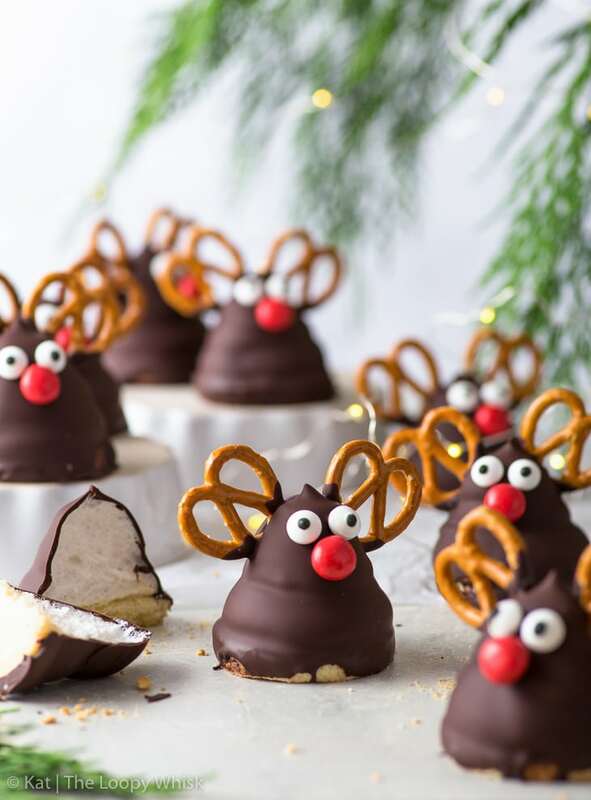 Case in point: these little red-nosed-reindeer cuties. But they’re so much more than that. 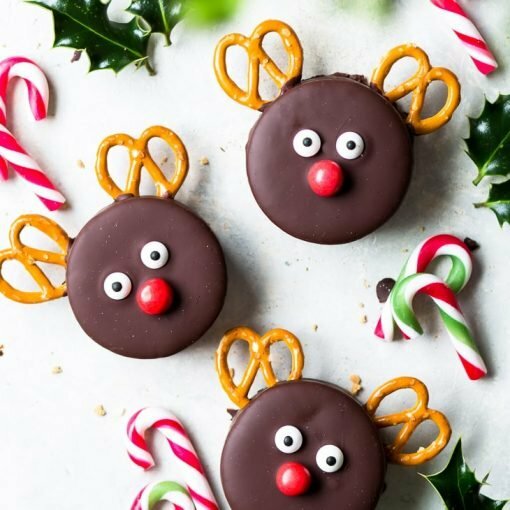 With the mere addition of a couple of pretzels, some goggly candy eyes and red M&M’s, they transform into these squee-worthy mounds of Christmassy cuteness. It doesn’t have to be complicated. In fact, the most memorable things are often the simplest. 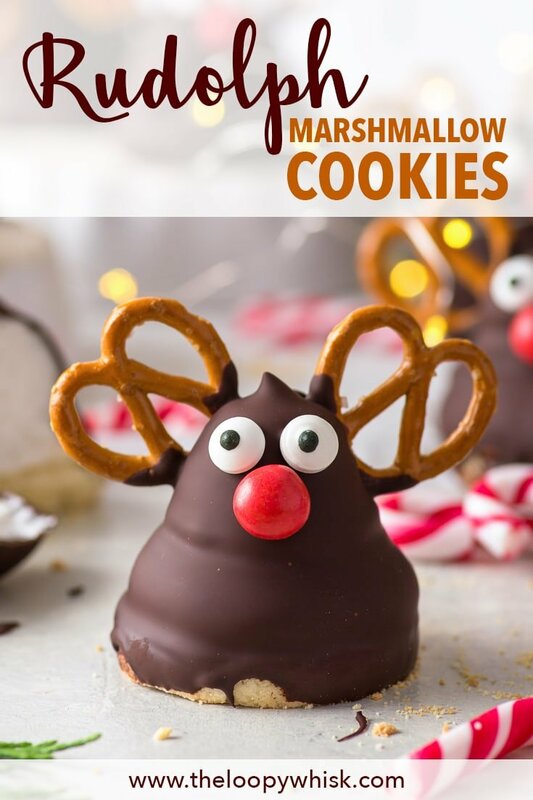 And while these Rudolph marshmallow cookies are super duper adorable, they’re also delicious. 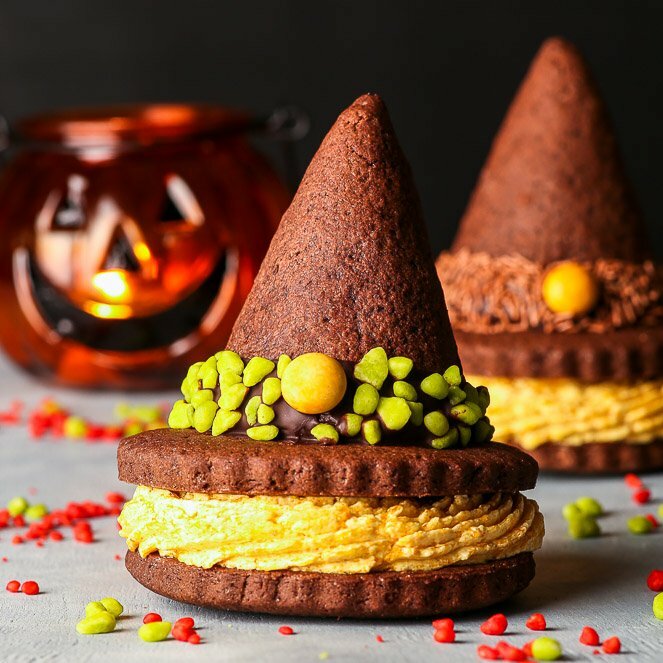 I mean, there’s marshmallow and cookies and chocolate – how could they possibly be anything other than delicious??? 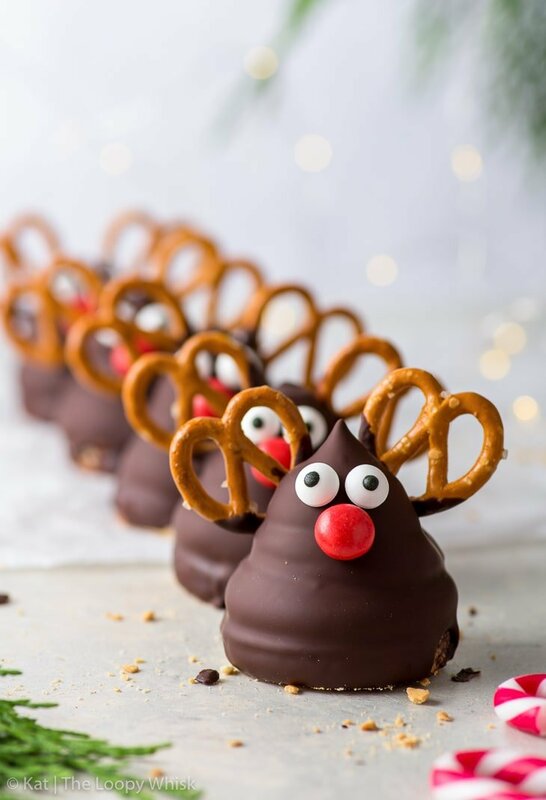 They’re also fun to make – preferably with Christmas music turned all the way up, while sipping some delicious hot chocolate. With marshmallows. Obviously. 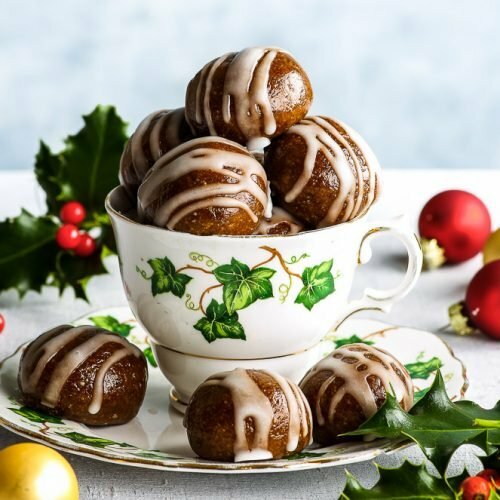 In a stand mixer with the paddle attachment, or using a hand mixer with the double beater attachment, cream the butter and sugar together until pale and fluffy. Add the egg and vanilla paste, and beat until evenly incorporated. Sift together the gluten free flour, xanthan gum and salt, and add them to the rest of the ingredients. Mix with the stand/hand mixer until the dough is smooth and comes together in a ball. The cookie dough shouldn't be sticky to touch. Wrap the cookie dough in cling film and refrigerate for about 1 hour. Pre-heat the oven to 355 ºF (180 ºC) and line two baking sheets with greaseproof/baking paper. After 1 hour, briefly knead the chilled cookie dough. At the beginning, it will be very crumbly but after about 1 minute of kneading, it will be firm but smooth. Roll out the cookie dough to about 4 - 5 mm thick. Using a round cookie cutter about 1 1/2 inch (4 cm) in diameter, cut out the cookies. 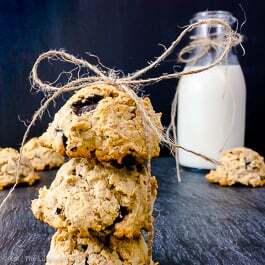 Re-use the scraps to make more cookies. Place the cookies onto the lined baking sheets about 1/2 inch apart. Bake at 355 ºF (180 ºC) for about 12 - 14 minutes. The cookies will be soft directly out of the oven – allow them to cool on the baking sheet. Mix the egg whites and sugar in a heat-proof bowl, and set the bowl above a pot of simmering water. Heat the meringue mixture with constant stirring until it reaches 150 ºF (65 ºC) and the sugar has melted. 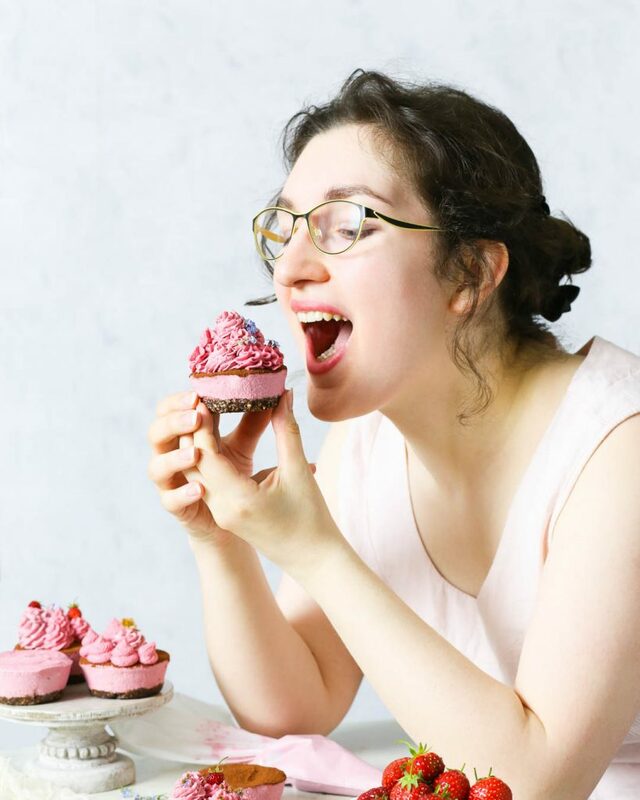 Transfer the heated meringue mixture into a stand mixer with a whisk attachment (or use a hand mixer with the double beater attachment) and whisk the mixture for 5 - 7 minutes, until it reaches room temperature and forms glossy peaks. Do not over-whisk as you can lose some of the fluffiness. Pour the dissolved gelatine slowly into the meringue while whisking at medium speed. Whisk for a further 3 - 4 minutes. 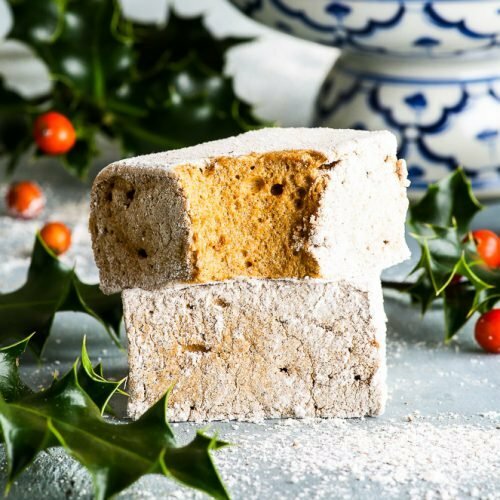 NOTE: Once you've made the marshmallow mixture, make sure to use it (i.e. pipe it) as soon as possible, as it sets quite quickly. Transfer the marshmallow mixture into a piping bag with a large round nozzle. Pipe three dollops of marshmallow onto each cookie, one on top of the other and getting smaller in size (see post for pictures). Allow the marshmallow to set for at least 1 hour. 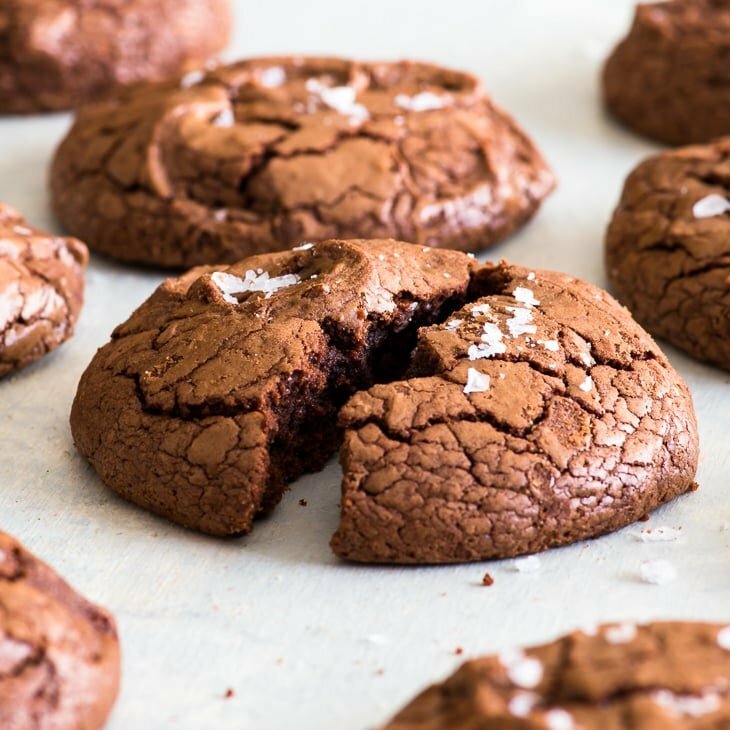 Once set, dip the marshmallow cookies into the melted dark chocolate. This is easiest if you transfer the chocolate into a deep mug or glass. 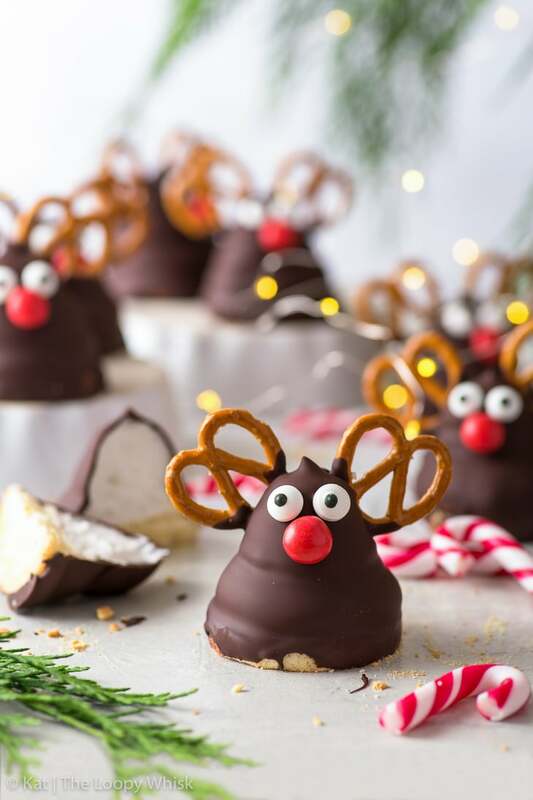 Allow the chocolate to partially set, then decorate with red M&M's, pretzels and candy eyes. 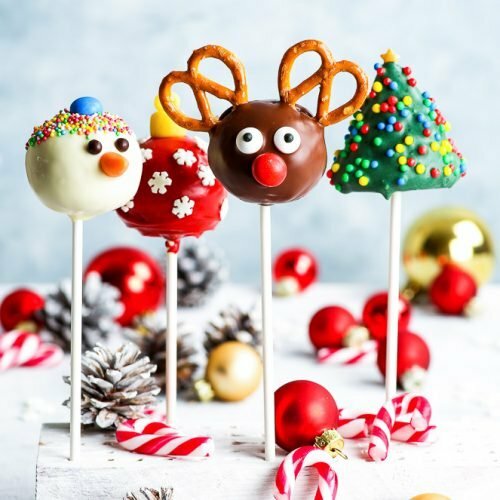 To make sure the pretzels are properly "inserted" into the marshmallow (so they don't fall off), make a small cut with a sharp knife where you want to place the pretzels beforehand. 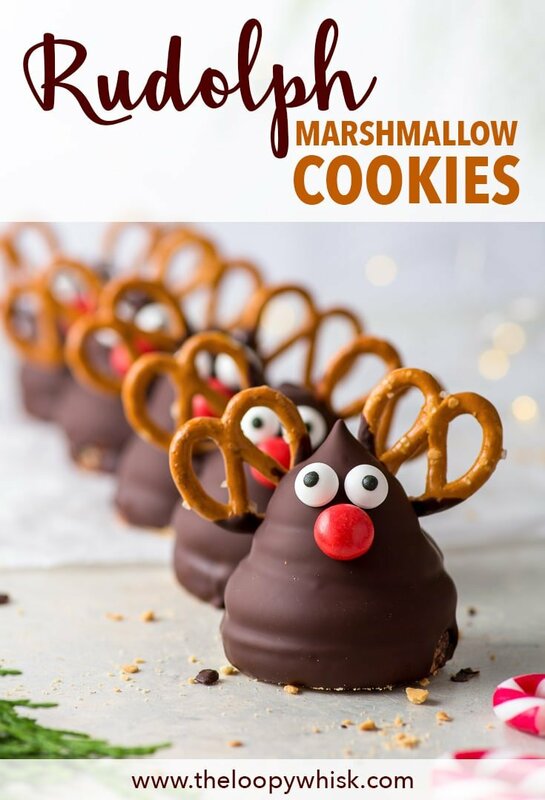 The Rudolph marshmallow cookies keep well in a closed container in a cool dry place for about 1 week. 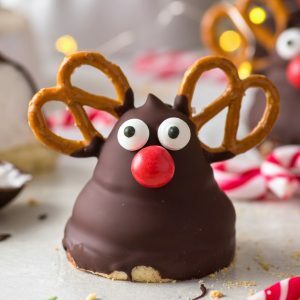 Looking for more adorable Christmas recipes?